Norfork Lake's spring fishing season is currently on fire. Top water action has started for large & smallmouth bass, white bass, striped bass and hybrid bass. Threadfin shad started to spawn several days ago and this got all the predator fish very energized. Fish are shallow inside of sunken buck brush in 3 - 20 feet of water. 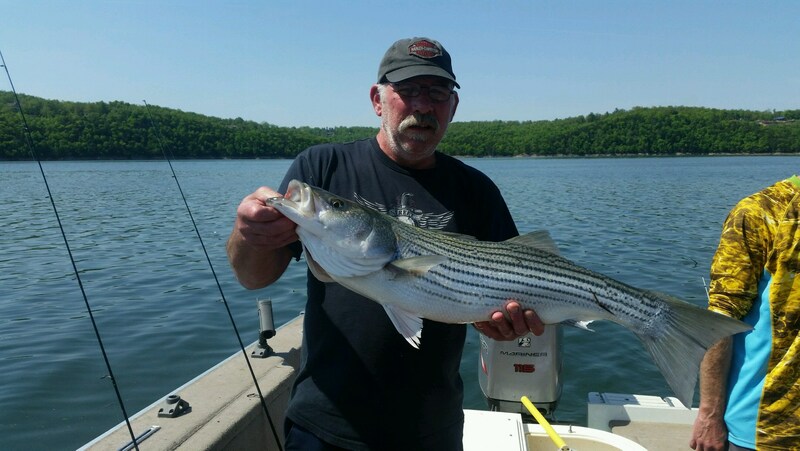 You can not ask for a better time to fish Norfork Lake. It is very exciting. 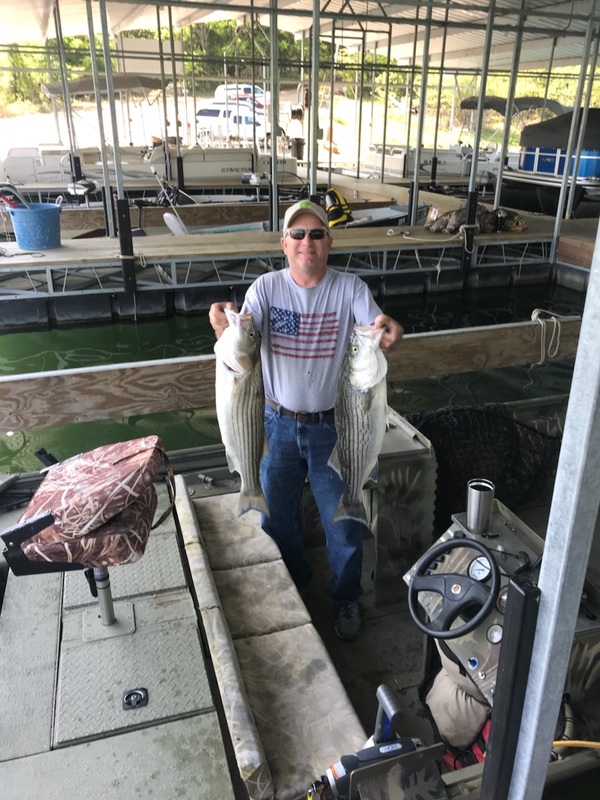 The striped and hybrid bass bite is improving daily. Fish are being caught by several different methods of fishing. Live bait has been productive by casting out a threadfin shad, gizzard shad or shiner with no weight or just a very small split shot. Top water baits such as a Zara Spook are working very well during top water activity as is casting a lure next to the buck brush and calling the fish up. 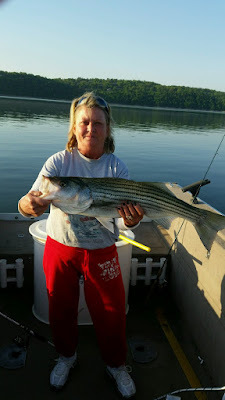 Soft plastics such as flukes or swim baits are also catching some nice size stripers. Some of the best fishing times for striped bass is from about one hour before daybreak through 8 to 9 AM, if it's a sunny day. It might last longer if the day is cloudy and/or rainy. During the afternoon and evening hours it appears the fish are out in deeper water. At times you can find a school that is feeding on shad on the surface, in the middle of the lake. 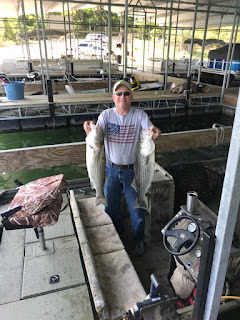 Today fishing was good all over the lake. 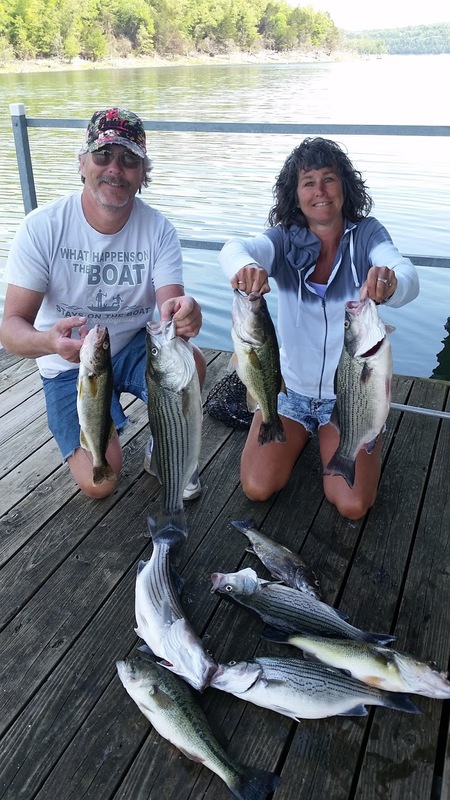 I know of 4 different areas that were producing striped bass for many fishermen and/or women. Lake flats in 15 - 25 feet of water, main lake points with sunken brush on it, and towards the backs of creeks and large coves. 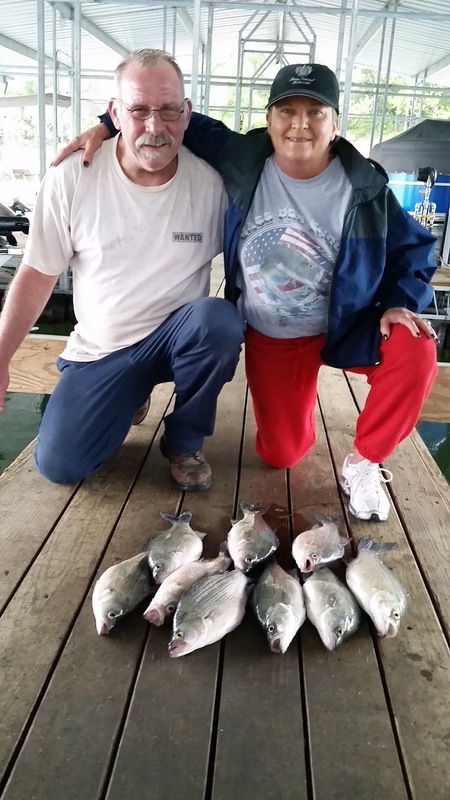 Top water action has been fun, but it does not necessarily mean that they will come up in the same area every day. The large and smallmouth bass bite has been excellent. Some of the bass have spawned and others are on the beds and still others are staging. It is a really fun time to fish for bass on Norfork Lake. Top water baits are some of the favorite baits being used. The old stand by soft plastics work along the bottom in 8 - 20 feet of water is catching fish. With the higher water level creature type baits are working, being cast right in front of the sunken buck brush. 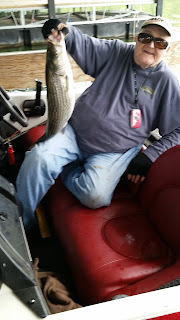 Let the bait sink and typically a bass will ambush the bait before it hits the bottom. 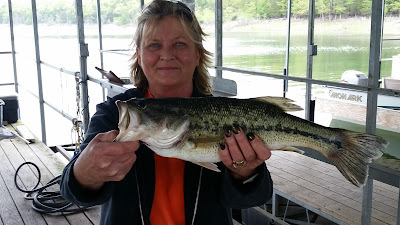 Bass are being caught all over the lake with points in creeks and coves being some of the best spots. The white bass bite is still very good. There has been some great top water action for the whites in the morning and evenings. Top water baits, blade type baits and spoons are catching some nice fish. Flats and back in the creeks are great areas to look. 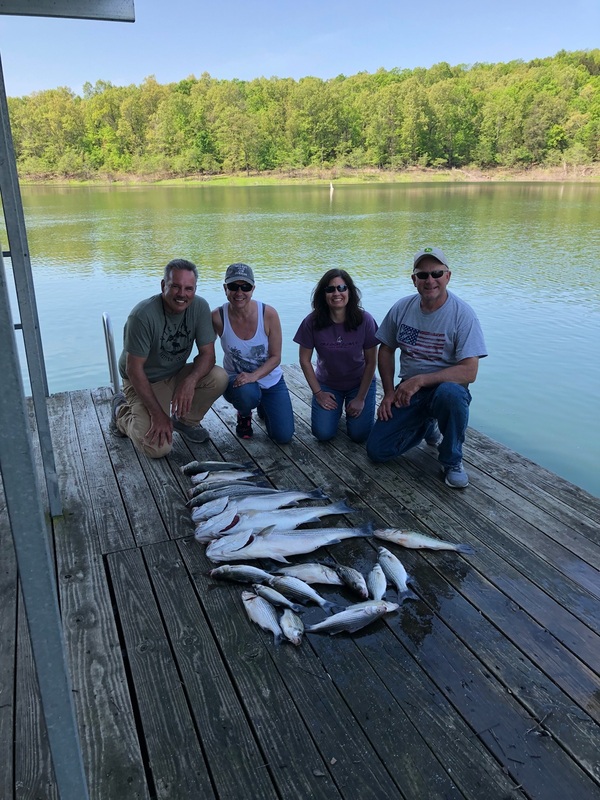 Walleye are being caught early and late in the day. They are located with most of the other predators, close to the sunken brush on the shore feeding on shad. The lake level is rising very slowly, maybe 1 - 2 inches per day. There has been power generation daily, but only for about 6 hours a day. The over all lake is very clear. Today I was sitting in 20 feet of water watching fish swim by on the bottom. You may find some stained water in some of the creeks and coves, but not much. The surface water temperature is rising. Today it started out in the high 60's and rose to the low 70's during the day.